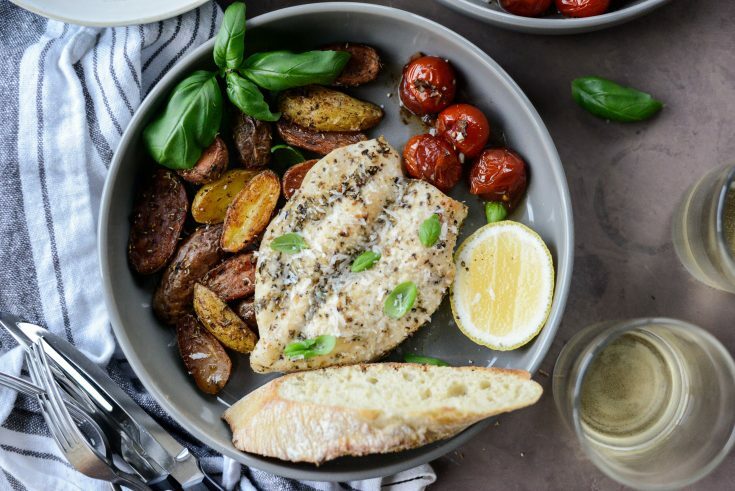 In this easy Tuscan Chicken and Potato Sheet Pan Dinner, fingerling potatoes roast alongside chicken breasts that have been seasoned with my homemade Tuscan seasoning blend, garlic and fresh lemon juice. 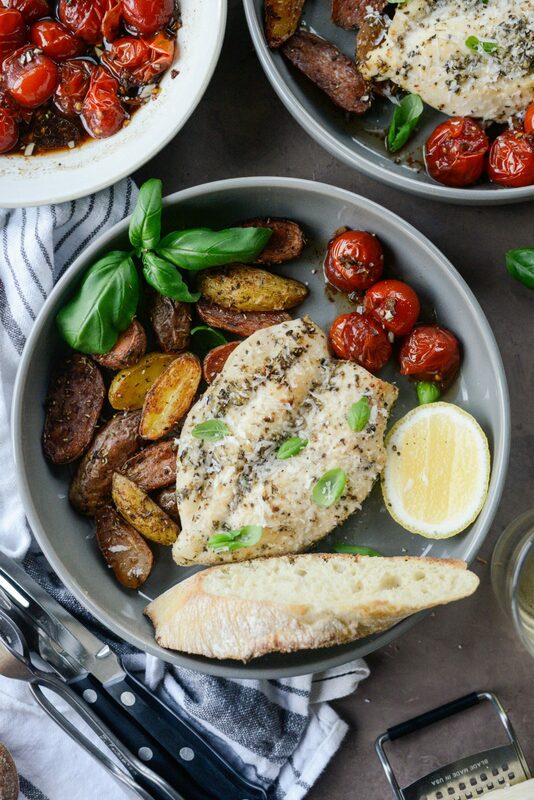 A side parcel of balsamic tomatoes completes this easy one-pan meal. Serves 4 in about 45 minutes. You have no idea how good it feels to not have to write about turkey or leftovers. Instead, I get to tell you about this delicious sheet pan dinner I made weeks ago. Since then, I’ve made it twice. That’s how much we loved it. 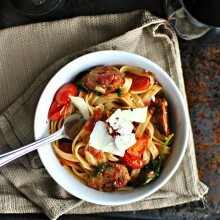 Early this month I randomly shared my recipe for Tuscan seasoning. 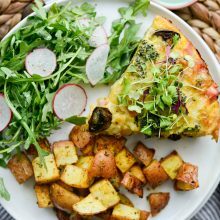 In it, a blend of dried herbs and spices like rosemary, fennel, onion and garlic powder create a simple yet aromatic blend that I put to work in this recipe. 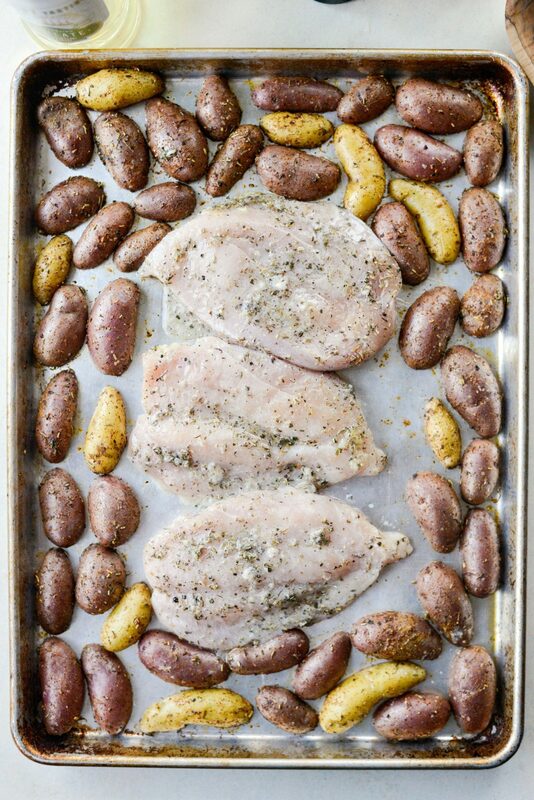 Seasoning not only the potatoes but the chicken, in what very well could be one of my favorite sheet pan dinners. 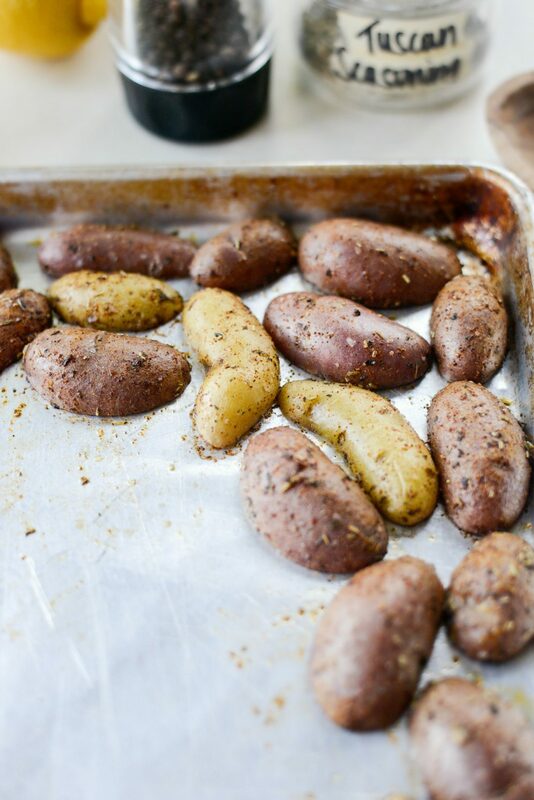 Here’s what you’ll need to prepare; 1-1/2 pounds fingerling potatoes (or other small, baby potatoes), olive oil, Homemade Tuscan Seasoning, 1/2 teaspoon garlic powder, 1/2 teaspoon paprika, salt and pepper, 3 to 4 chicken breasts that have either been butterflied (alternatively 4 boneless skinless chicken breasts will do), juice from a lemon – about 2 tablespoons, 4 cloves garlic – divided, Pecorino Romano cheese, 1 pint cherry tomatoes, 2 teaspoons balsamic vinegar and fresh basil. First, preheat you oven to 400º. 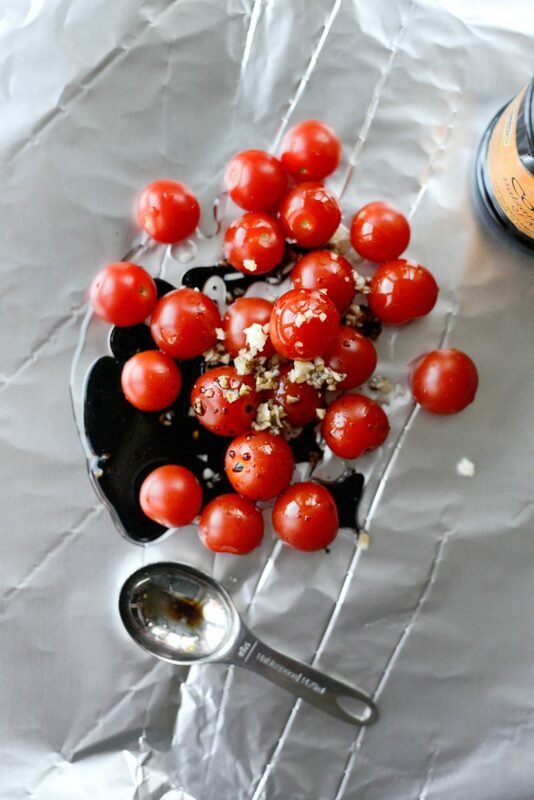 Next, place the pint of (rinsed and patted dry) cherry tomatoes and 2 cloves of garlic that have been minced onto a large sheet of aluminum foil. 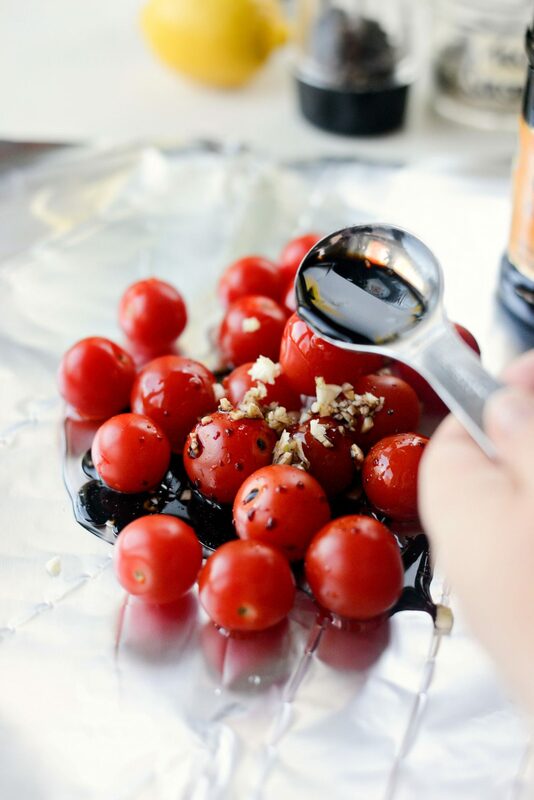 Drizzle with 2 teaspoons each of olive oil and balsamic vinegar. Then season with a pinch of kosher salt and a few turns of freshly ground black pepper. Once preheated, place the parcel on the bottom rack of your oven and roast for 20 minutes. 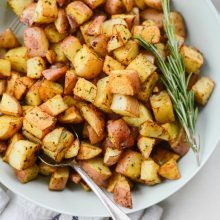 Meanwhile, in a mixing bowl, toss the halved potatoes with 2 teaspoons olive oil, 1 teaspoon Tuscan seasoning, 1/2 teaspoon both garlic powder and paprika, and a few pinches of kosher salt. 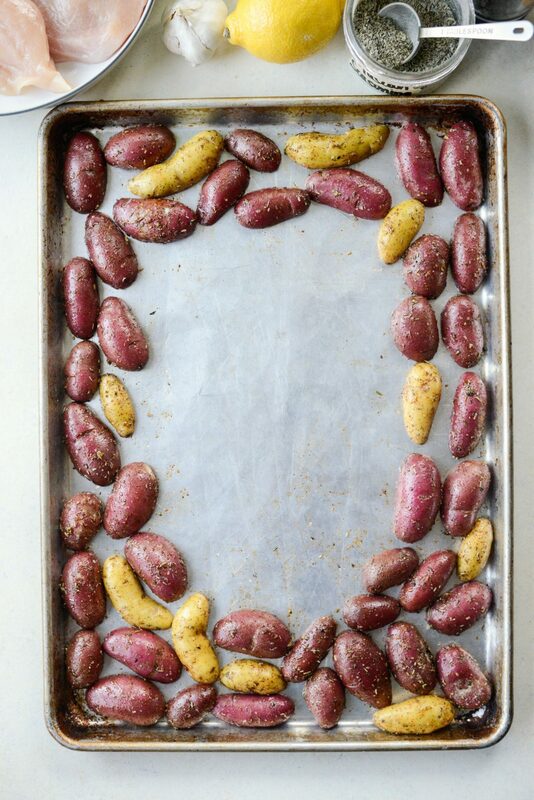 Then arrange the potatoes around the parameter of a rimmed, metal baking sheet. Roast on the middle rack of your preheated oven for 10 minutes. 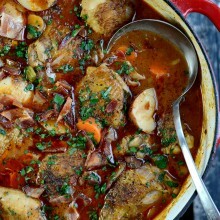 Next place the chicken into a shallow dish or use the bowl from the potatoes. Drizzle with a teaspoon of olive oil and the juice of 1 lemon. Grate 2 cloves of garlic and measure and add in 1 tablespoon of the tuscan seasoning, toss to coat evenly. 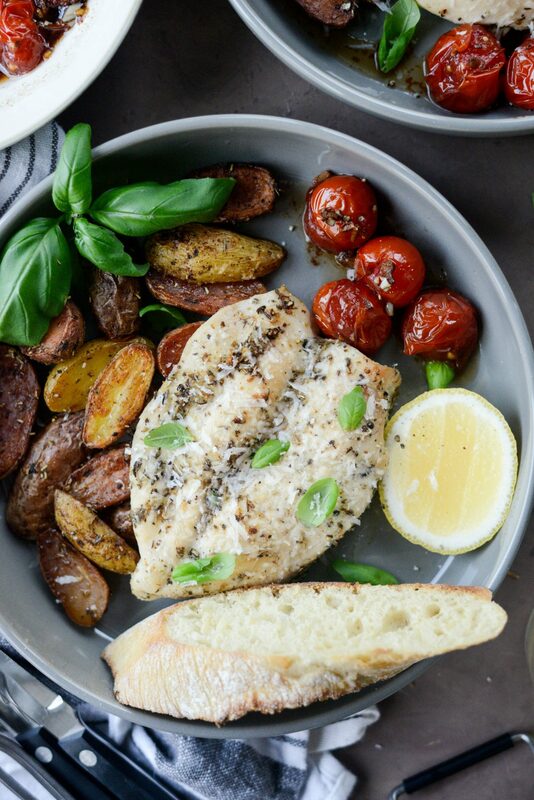 Once the potatoes have roasted for 10 minutes, place the chicken breasts and any remaining marinade in the center of the sheet pan and roast for 20 minutes. Rotate the pan half way through to ensure even cooking. Once the chicken has roasted for 18 to 20 minutes, remove the sheet pan and move the oven rack to the highest position and turn on your broiler. 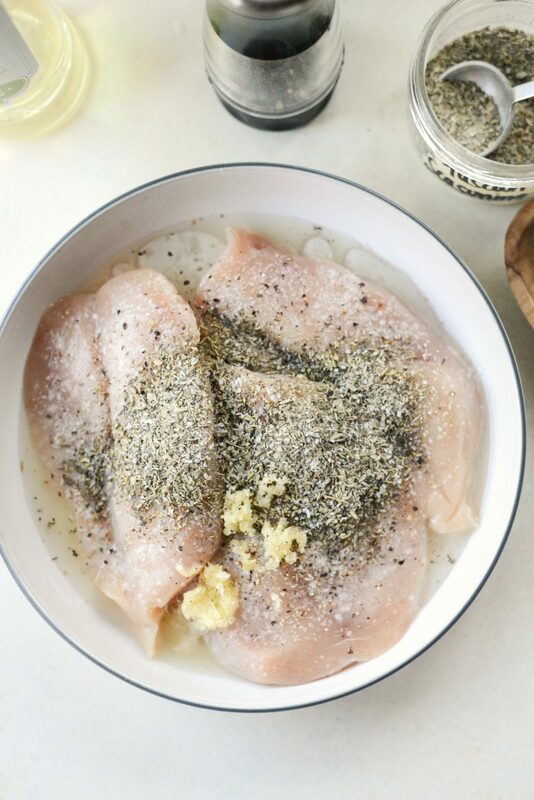 Next, grate roughly a 1/2 tablespoon of Pecorino Romano cheese over top of each of the chicken breasts and slide the pan under the boiler until the cheese has melted and the chicken is golden in spots. Watch carefully so the potatoes and/or chicken do not burn. Once the tomatoes have been in the oven for 20 to 25 minutes, take them out of the oven and onto a heat safe surface. Carefully open the parcel and if any of the tomatoes are still plump, use a fork to pop them. 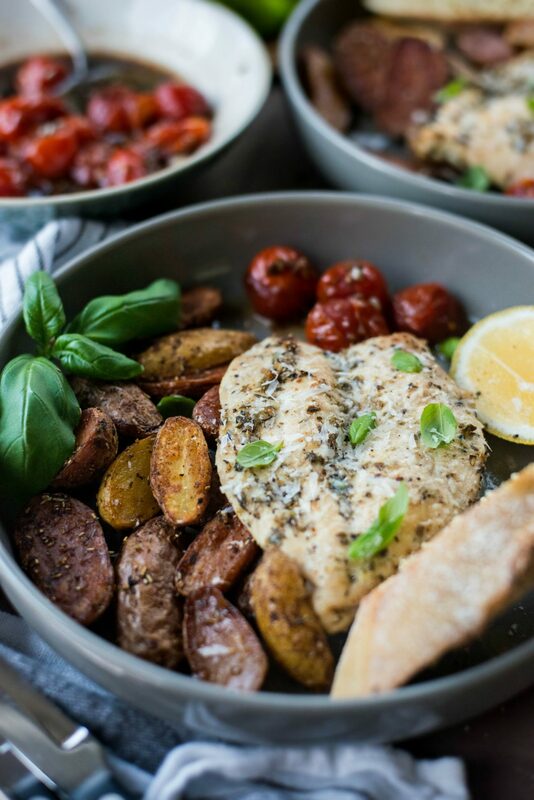 Finally, serve the Tuscan chicken with the roasted potatoes, balsamic burst tomatoes on the side (or on top!) 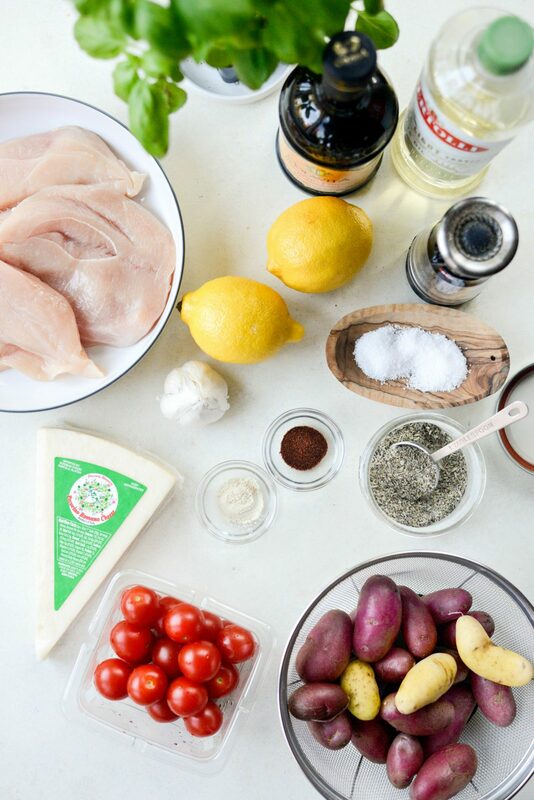 with a squeeze of fresh lemon over the chicken and top with more Pecorino, if desired, and fresh basil leaves. The seasoned potatoes are crispy and the chicken is moist and delicious. 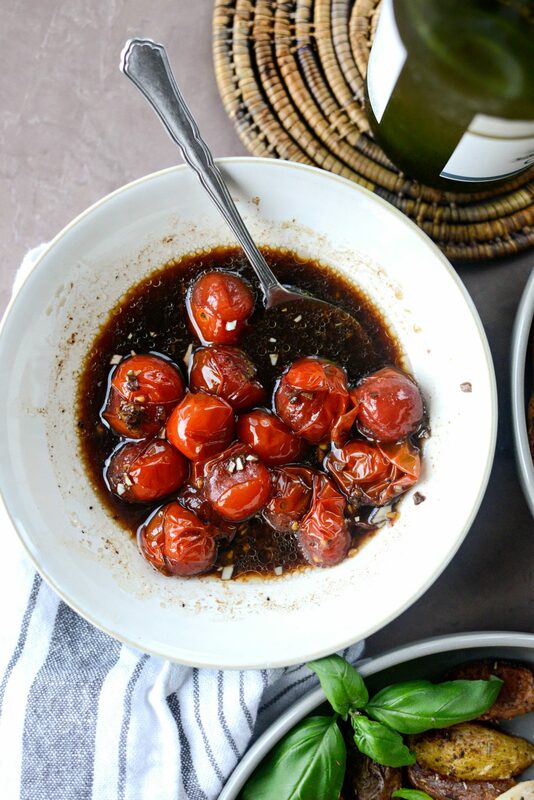 The balsamic burst tomatoes are the brightness this meal needs. 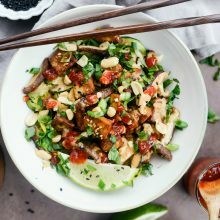 Not only adding a pop of color to the plate and delicious with bread. I’m just saying. 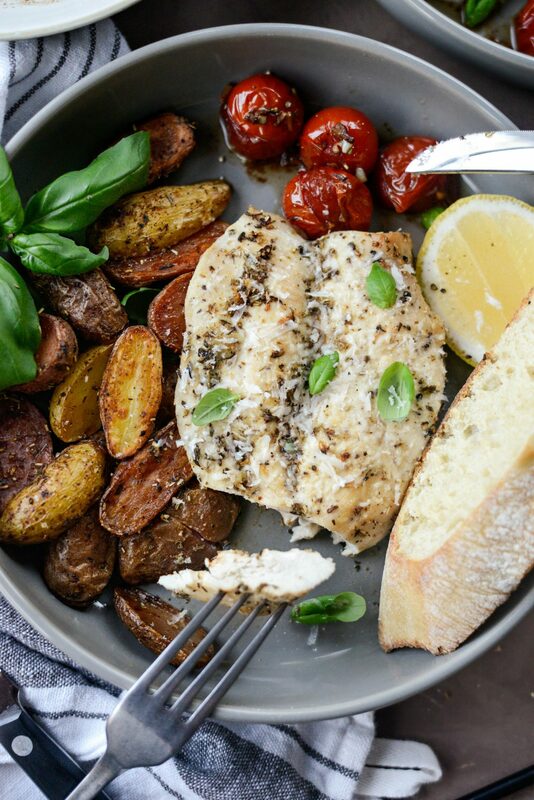 This is a gourmet meal that is effortlessly made using a sheet pan and foil. 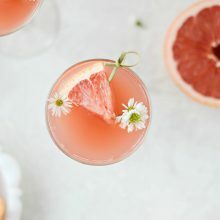 The flavors are out of this world, I just know you are going to love this one! Enjoy! 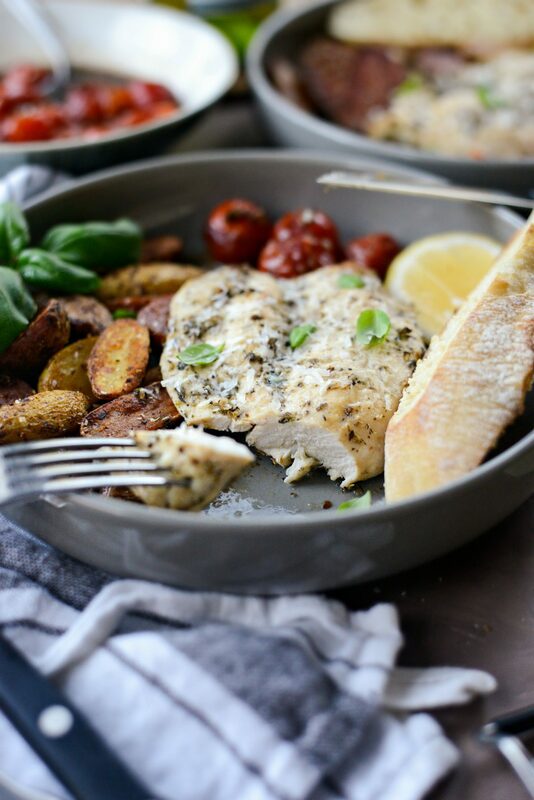 And if you give this Tuscan Chicken and Potato Sheet Pan Dinner recipe a try, let me know! Snap a photo and tag me on twitter or instagram! 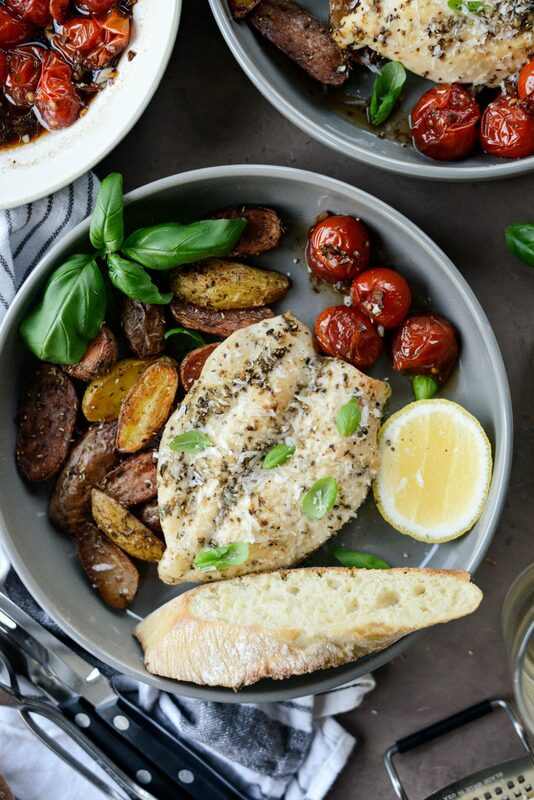 In this easy Tuscan Chicken and Potato Sheet Pan Dinner, fingerling potatoes roast alongside chicken breast that are seasoned with homemade Tuscan season blend, garlic and fresh lemon juice. 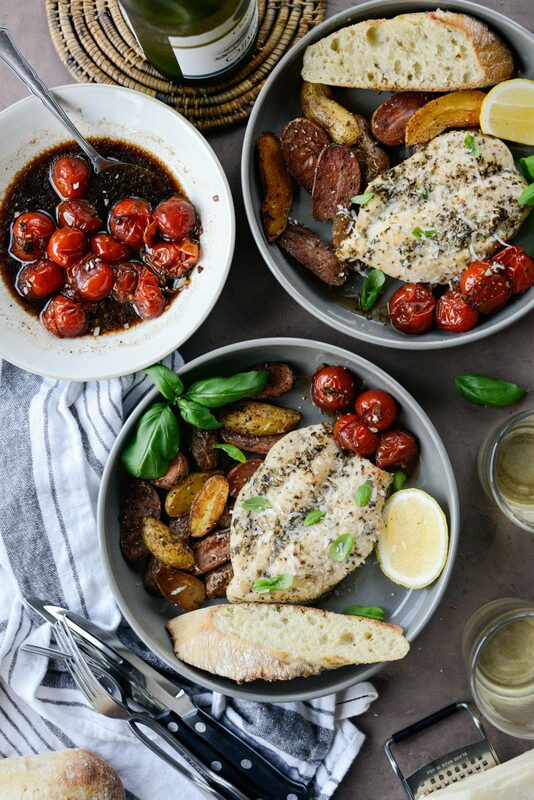 A side parcel of balsamic tomatoes completes this easy one-pan meal. Serves 4 in about 45 minutes. 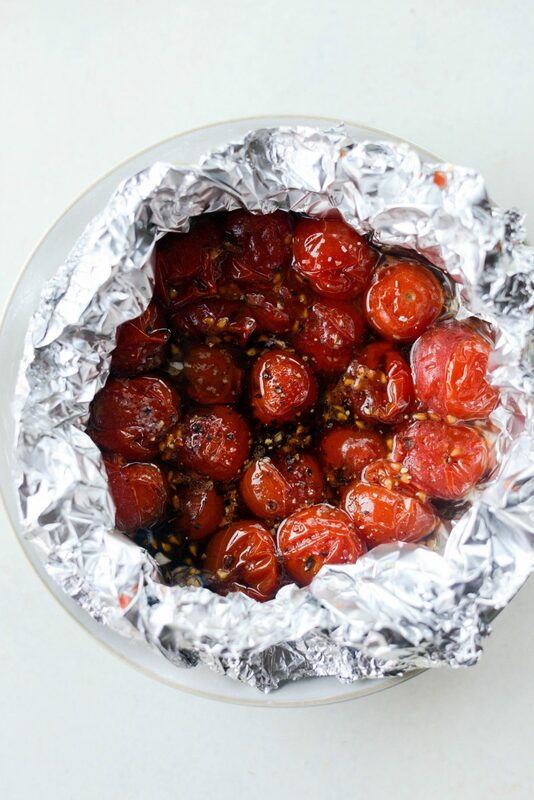 On a piece of aluminum foil, place the tomatoes, garlic, olive oil, balsamic vinegar and seal the foil to form a pouch. 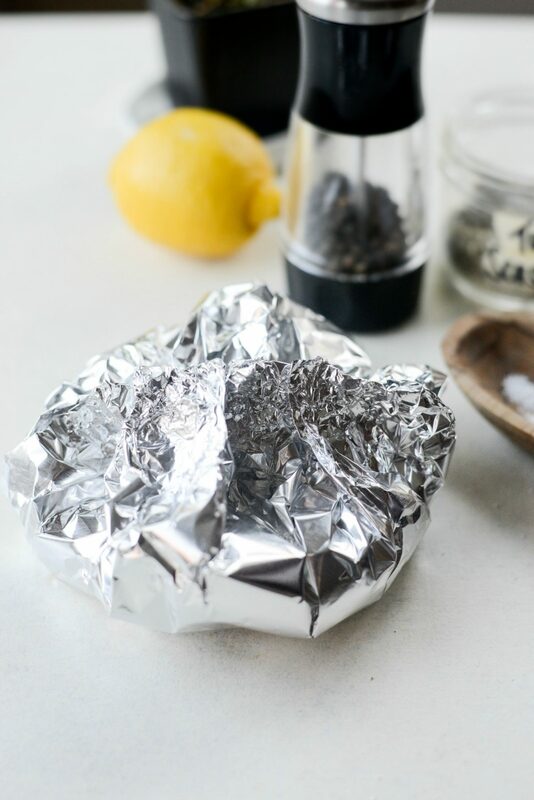 Once made, immediately place the foil parcel on the bottom rack and roast for the 20 minutes. Remove the parcel and if the tomatoes haven't burst on their own, use a fork to lightly press on the tomatoes. 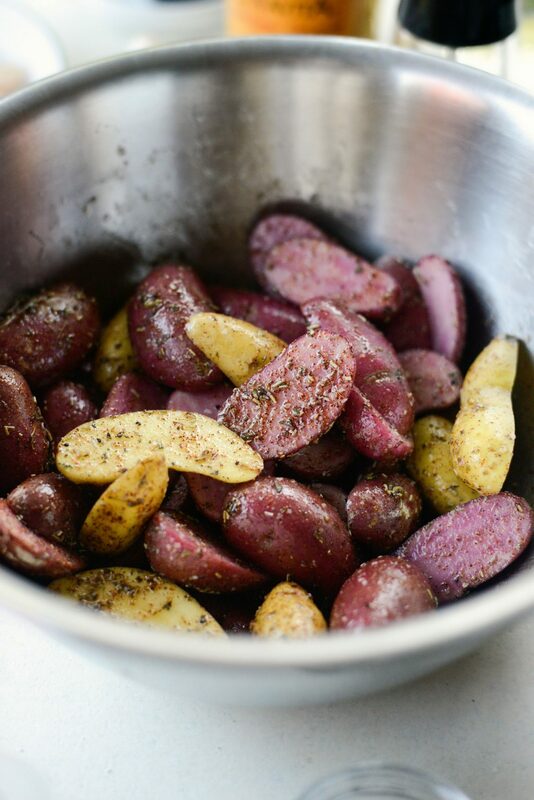 Next toss the potato halves with the olive oil, Tuscan seasoning, garlic powder, paprika and a pinch or two of kosher salt and black pepper. 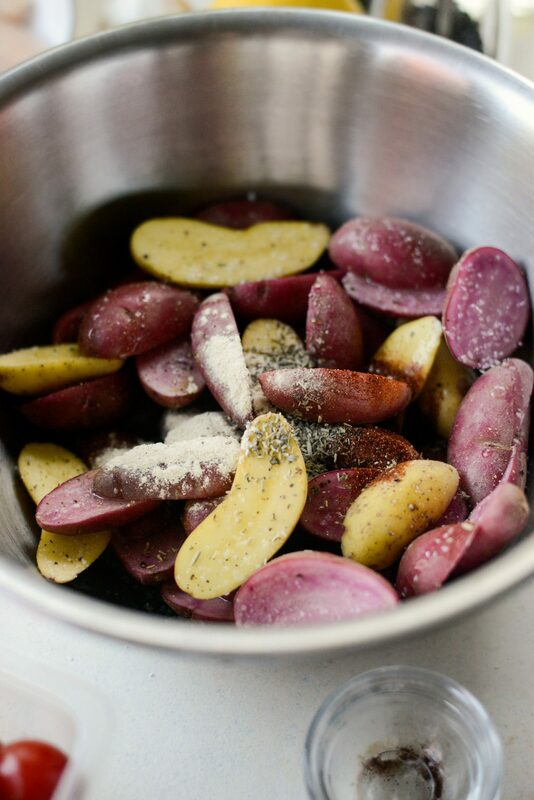 Place the seasoned potatoes on the parameter of a rimmed metal baking sheet. Slide the pan onto the middle rack of your preheated oven to roast for 10 minutes. 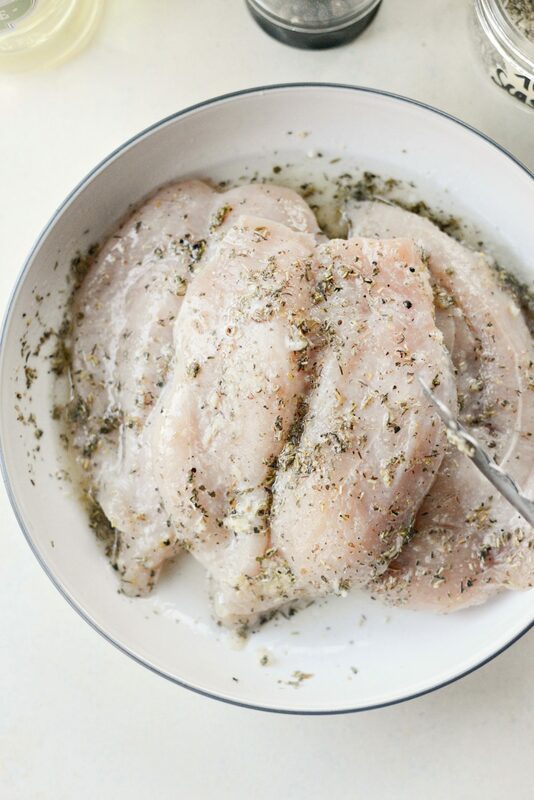 Toss the chicken breasts with the olive oil, the lemon juice, garlic and seasoning. Set off to the side. 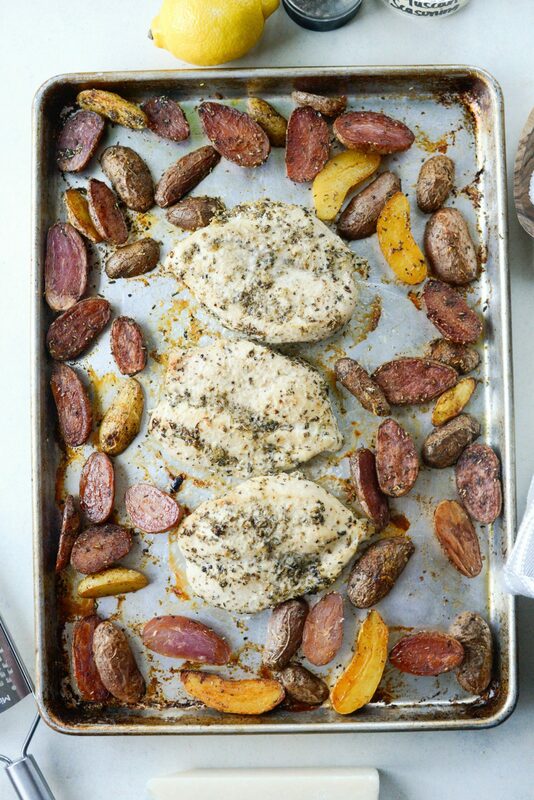 Once the potatoes have roasted for 10 minutes, remove the sheet pan and place the chicken breasts in the center. Return the pan back to the oven and roast for 20 minutes, rotating the pan halfway through. Once the chicken is cooked, turn your broiler on high and (use oven mitts) move the rack to the highest position in your oven. Sprinkle with pecorino Romano cheese and slip under the broiler for a few minutes. Watch closely. Serve with slices of warm bread. Love you recipes. 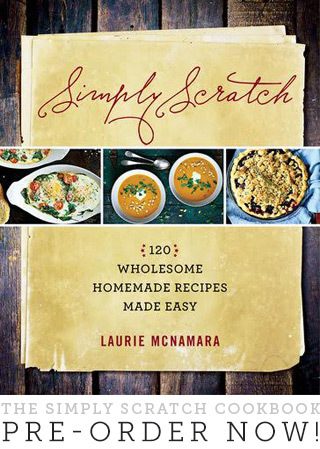 This one was great but the directions were conflicting, especially on tomato cooking. Mentioned different times in comments, description and summary. Needs some corrections.